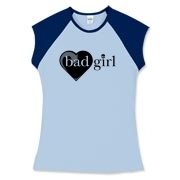 Bad Girl t-shirt design for the girl who you love to get bad with. 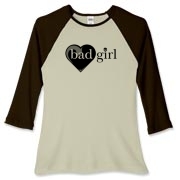 Slick looking Bad Girl Shirt features a romantic heart framing the bad and a punkish skull in the word, "girl." 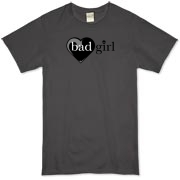 This is one of our newer Bad Girl T-shirt designs and it's already received a great response from our fans. 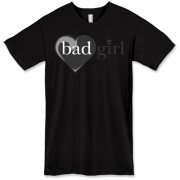 This Bad Girl Shirt is a dark design, even on the black t-shirts we used a shadowy color to give it a hidden, mysterious look. 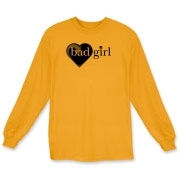 The typography is in classic Times Roman giving the design a very unique and classy feel. 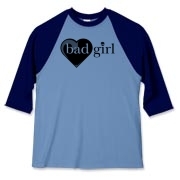 This is one Bad Girl Shirt that's perfect for the lady with style while still allowing her bad side to show from time to time. 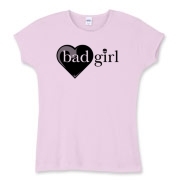 To the right you will see several nice examples of our new Bad Girl shirt design but there's loads more available. 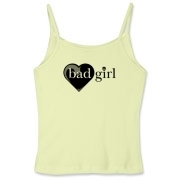 If you click on the larger image you can see them too.